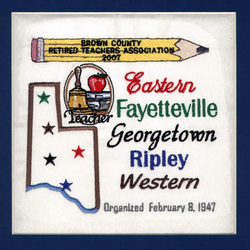 Brown County is in southwest Ohio and has the Ohio River as one of its borders.The Retired Teachers of Brown County, Ohio met February 8, 1947 at the county superintendent's office to organize the Brown County Retired Teachers Association and to elect officers. There were twelve members present at the organization meeting. Brown County's members have a history of being active in legislation affecting retired teachers. The chapter has also been active in local and community affairs. The constitution and bylaws of the chapter were updated in 1995.